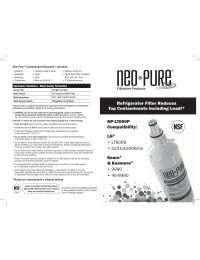 The LG LT600P(B) 5231JA2006 Compatible Filter Replacement by Neo-Pure The latest Neo-Pure refrigerator water filter is designed to replace the LG LT600P(B) model. This new filter is much more affordable, while still maintaining the utmost quality standards of drinking water. The NP-LT600P(B) surpasses reduction standards set forth by NSF International for toxins and harmful chemicals. The activated carbon core captures microscopic impurities via adsorption, sequestering chlorine, solid particles including dirt and rust, asbestos, and parasites. Furthermore, the carbon is made out of charred coconut shell, which is a much more natural and environmentally-friendly alternative to coal. The sub-micron formula of the two-stage filtration process will leave the water and ice from your refrigerator safer and better-tasting. Guaranteed Compatibility with the LG LT600P(B), backed by a manufacturer 100% fit-guarantee. Over 97% Reduction of chlorine, dirt and rust, parasites and asbestos. Environmentally-Friendly coconut shell carbon core. Detoxifies Tap Water via advanced two-stage filtration. 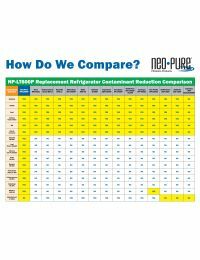 NSF Certified The Neo-Pure LG LT600P(B) compatible filter has been manufactured to NSF Standard 42 engineering standards. Reduces Harmful Contaminants Tested against international standards for the reduction of chlorine, asbestos and parasites. 100% Fit Gaurantee The NP-LT600P(B) has been designed for 100% leak-free fit in your LG refrigerator. Note: For a comprehensive compatibility list please look to the bottom of this page. 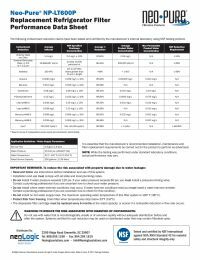 Per manufacturer recommendations, your filter should be replaced every six months or 200 gallons. The indicator light on your refrigerator is timed to remind you to change your filter, and should be minded for optimal performance. 1.Turn off the water supply. Locate the water shut-off valve, which is located behind your refrigerator. Turn the valve to the OFF position. 2. Empty the water. Dispense any remaining water from the tubing in your refrigerator. 3. Locate and remove old filter. The filter is located in a port mounted in the top corner of your refrigerator. Twist the easy-grab handle counterclockwise to release, and remove from the port. 4. Install new filter. Remove all packaging from new filter cartridge, insert into the port, and turn clockwise to lock. Locate and remove your old refrigerator water filter inside your refrigerator. On most models, this will be found in the upper left corner of your fridge. 5. Flush before use. Turn the water supply back on and run at least 2 gallons (about 5 minutes) through the water dispenser with your new filter. 6. Reset the indicator light. Press the reset button and hold for 3 seconds.